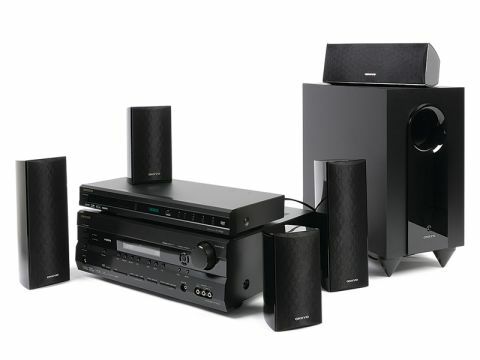 The HT-C5115 seems a great value home cinema package, but are you better off buying separates? The Onkyo HT-C5115 bundles a standalone DVD player with an AV receiver and a 5.1 speaker package in one big box. It's one heck of a deal; Onk's separate components are aggressively priced at the best of times, and here, the company has brought the tag down to £400 for the complete package. Going the separates route also brings advantages in performance quality, albeit at the expense of a little convenience. The DVD player is very much entry-level, but it can handle most formats and upscales video to 1080p. Being housed in a separate cabinet means less signal degradation and audio jitter, too. The AV receiver is a key attraction. It's no powerhouse, but for sheer excitement I feel it blows rival mini systems out of the water. Its back-panel offers three HDMI v1.1 inputs, which is helpful. Connecting it together takes a while, but all of the cables are thrown in and it's not too challenging. You might possibly need a three-gang adapter to plug in all the mains leads, though. ﬂavours of Dolby and DTS 5.1 formats. The regular DD 5.1 audio track on Iron Man, for example, offers subtle ambient effects and sub-stretching explosions in equal measure. The ﬁve MDF speakers and supplied cable let you spread the soundﬁeld all around the room, but in truth they're not the most substantial cabinets and are the limiting factor in the sonic equation. The package has clearly been built to a tight budget, but it still manages to deliver a cohesive and satisfyingly large sound. The subwoofer adds enough (fairly uncontrolled) bass to excite a modestly-sized room and, overall, this separates solution delivers a big bang for your buck. Picture-wise, the DVD player does a reasonable job of upscaling standard deﬁnition DVDs to 720p, although I feel there's little point pushing the output to 1080p. It also makes some sense to channel the HDMI cable directly to the TV rather than through the receiver because this will shorten the signal path signiﬁcantly. If sound quality is a priority, then separates is the way forward. With its dedicated electronics and full quota of speakers, it can a deliver genuine home cinema experience. Some may feel it a shame that convenience and style have to be sacriﬁced, but the undeniable advantage of separates is that you can upgrade them. And with those two extra HDMI inputs it won't be long before you add a set-top box and games console to the mix.